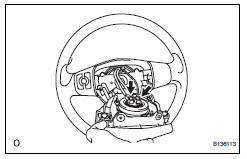 Support the steering pad with one hand as shown in the illustration. Connect the 2 airbag connectors. 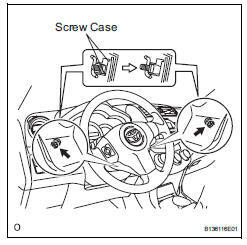 Install the steering pad after confirming that the circumference grooves of the screws are caught on the screw case. Using a t30 "torx" driver, install the 2 screws. Check for cuts, cracks or discoloration on the steering pad outer surface and in the grooved portion. Check that the horn sounds.